The Eucumbene river still hasn’t fired yet not many reports coming in as yet let’s hope the weather warms up so the insect life gets active soon. 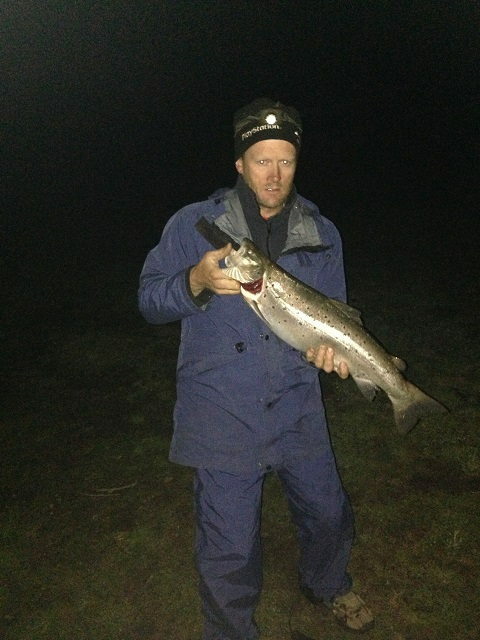 Don’t forget about the Monaro rivers we have been stocking them for some time now so they should be fishing well if you haven’t fished these rivers around hear give it a go the rivers are running and there clear. To me this is fishing and it’s been awhile now and I’m looking forward to getting out there. Remember the Eucumbene and Thredbo are not the only rivers about get out there and have a look at all the other rivers you will be surprised. Remember pick your times to fish the rivers Best times have been in the afternoons if you are fishing in the middle of the day B/H Nymphs have been working well. Remember the mountain streams are fishing hard try fishing rivers you haven’t fish before!! Like the Snowy below the Dam wall, Mowambah, Upper Snowy river, Gungarlin river. 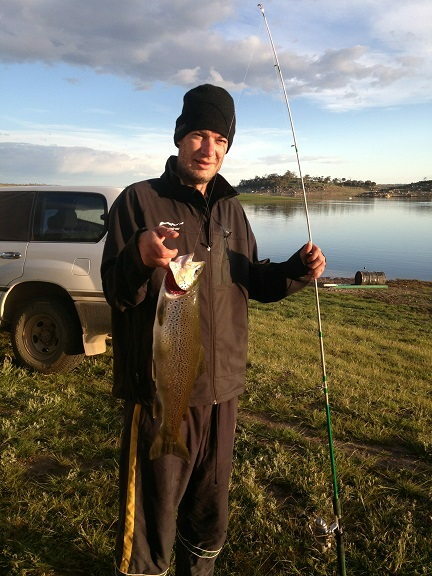 Lake Eucumbene:-reports are coming with fisherman doing it hard around the lake with only Browns being Caught and not many rainbows about. In the last few days there has been good reports of rainbows coming in close and hitting hard using Black Minnows, Fuzzys, black Nymphs most of the best fishing have been down the bottom end of the lake around Rushes, seven gates, there’s really not much we can say about the lake at the Moment the insect life is not happening and the Mudeye haven’t showed up yet but this will happen soon with the weather getting warmer and things are starting to look good Remember it’s only early days yet and once the Mudeye’s start the rainbows will start moving around more. Best wet flies are black minnows, fuzzys, B/H Nymphs black if the fish are rising use the Nymph Quick small jabs then stop. 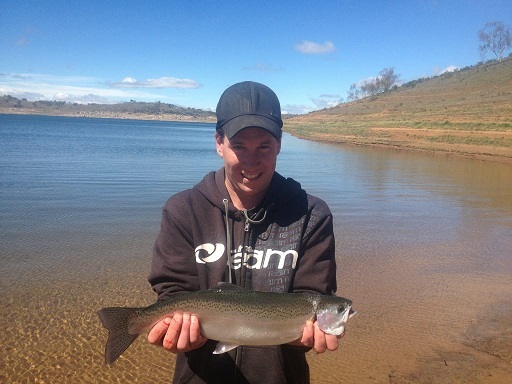 Lake Jindabyne:- Has been much the same best times are early mornings with a dry fly with a Nymph dropper in the afternoons woolly buggers, black phantom, woolly worm black red, most of the fishing has been ok late in the afternoons with the fish more active. With the lake staying at a good level the fish are starting to move closer to the banks again the Mudeye’s haven’t come on yet so when this happens I’m sure the fishing will pick up remember it’s still early days yet!! 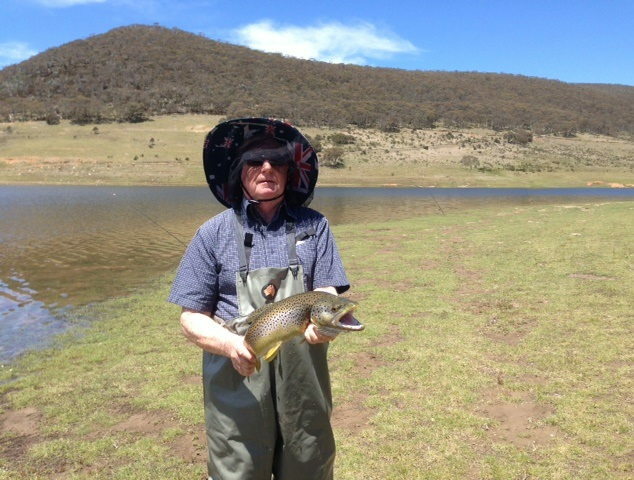 best tassies are most yellow wings, don’t forget to try the sting lures as well. 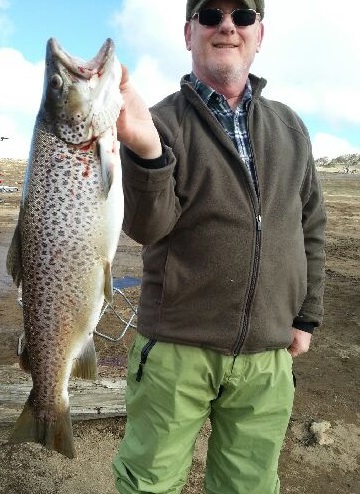 Lake Jindabyne:- has been doing well up around Kalkitewith good reports of browns and rainbow taking Blades, Rapalas, Tassie devils best times are early mornings, late afternoons when the weather is nice and cool. 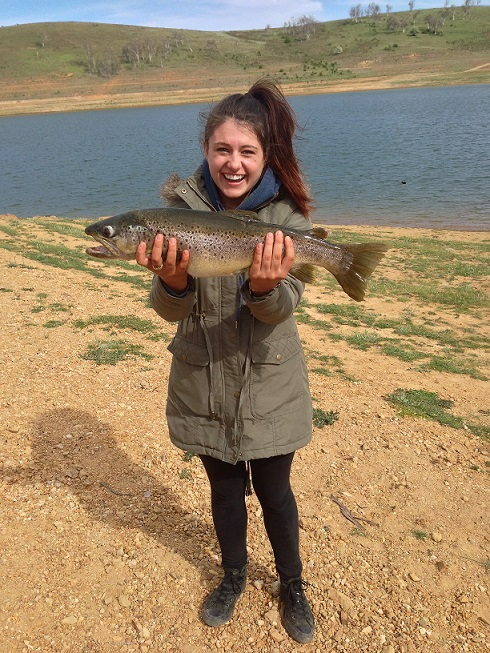 More reports from jindy would be good so if anyone has been fishing up around jindy you can sent your report to info@alpineangler.com.au or your photos to 0412915201. 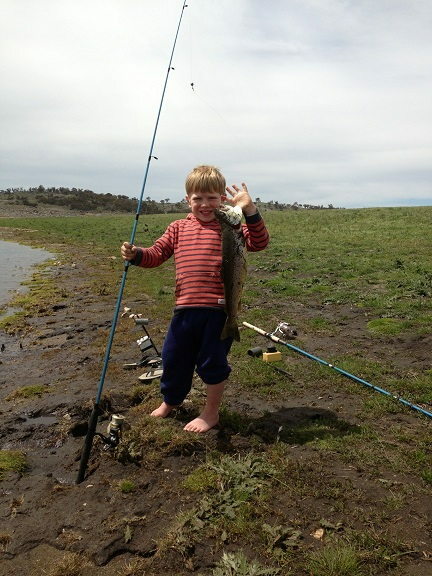 Eucumbene-:Bait fishing is really good with some good reports coming in most off the fishing has been down the bottom end off the lake the browns are taking worms and Mudeyes with the worms doing the best. The power bait has been a little slow but it’s still working well on the rainbows. Bait fishing has been good in most areas on the lake most fisherman are doing well in the afternoons and early mornings if you are fishing in the middle of the day with worms get the bait out into the deeper water and as the day gets shorter bring it in closer. The rainbows are starting to come in closer in the afternoons this is a good time to get the power bait out. Bob Farrawell -3lb Brown on Scrubbie. 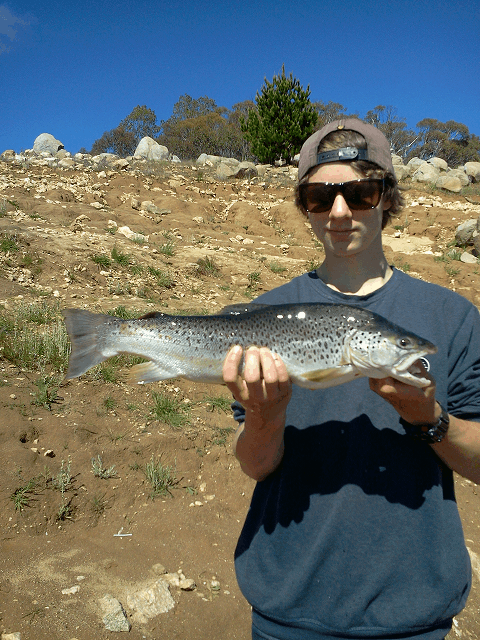 JINDABYNE... Jindabyne has Improved over the few weeks with most of the fishing on the western side of the lake still having good reports of browns coming in with a few rainbows taking the power bait in the afternoons. Best bait is worms and Mudeyes again if your are fishing in the middle of the day get the bait out into the deeper water as the day goes on bring it in closer. 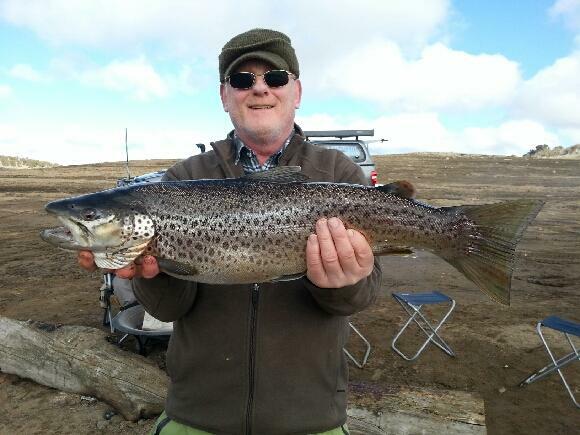 Brown 2.842kg which took bait section out and second overall in the Snowy comp.